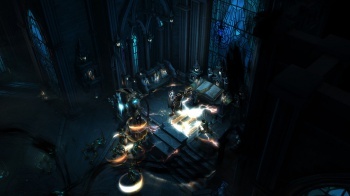 The PS4 of Diablo III: Reaper of Souls will contain everything up to patch 2.0.4 at launch. Diablo fans who are getting bored with all the cool new features Reaper of Souls added to the game, won't have to wait long for new toys to play with. In an interview with Shacknews, various members of the Diablo III team talked about their plans for the future, and some upcoming features for patch 2.1 - including ladder seasons and "tiered" rifts. Ladder seasons will work similarly to how they did in Diablo II - players start with a brand new character without access to any of the gold or items they have collected on their primary account, and try to get as far through the game as possible in a single season, and rise to the top of the global leaderboards. After the season ends, all of your progress - your experience, your items, your gold, etc. - will be rolled back onto your primary account. Blizzard also plans to add some power, season-specific legendary items to further entice players to give the system a try. "The goal is the fresh-start feeling - so many changes and tweaks have happened since the launch of Diablo III - it is really energizing and fun to recreate that 'first-moment-in-a-new-game' feeling," said Production Director John Hight. The second major new addition is "Tiered Rifts". Players familar with Diablo III's current endgame are no doubt aware of "Nephalem Rifts" - powerful, randomly generated dungeons found in Adventure mode that have an increased chance for legendary drops. Tiered Rifts add to that concept by allowing players to jump to a second, more powerful inception-style "rift within a rift" if they finish fast enough. "For example, if you finished a Tiered Rift in just a few minutes, you'd get to jump ahead to a much harder rift." And for those of you PlayStation 4 gamers who are still patiently waiting for Reaper of Souls to release on the platform, Hight says that the PS4 version will include all the updates to Diablo III up to patch 2.0.4 (the current live build of the game). Now if you'll excuse me, I have to go back to endlessly farming blood shards only to have Kadala laugh at me when I beg her for a Starmetal Kukuri.